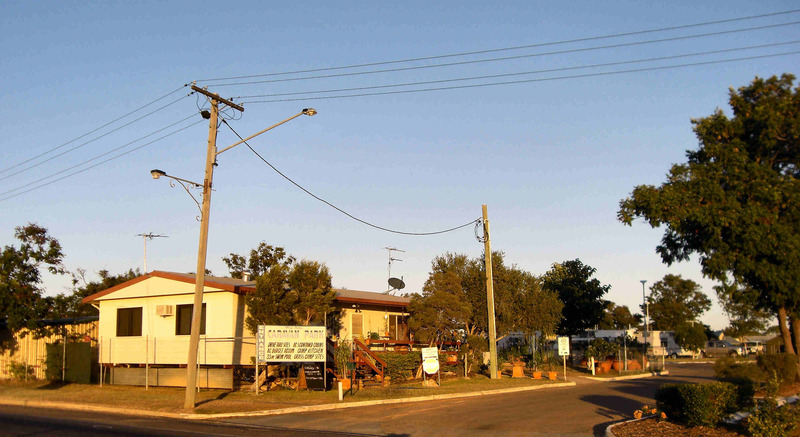 to find a suitable caravan park and not hit too many 'roos on the way. which is about half way, then on we went, chewing fuel like a Jumbo Jet. 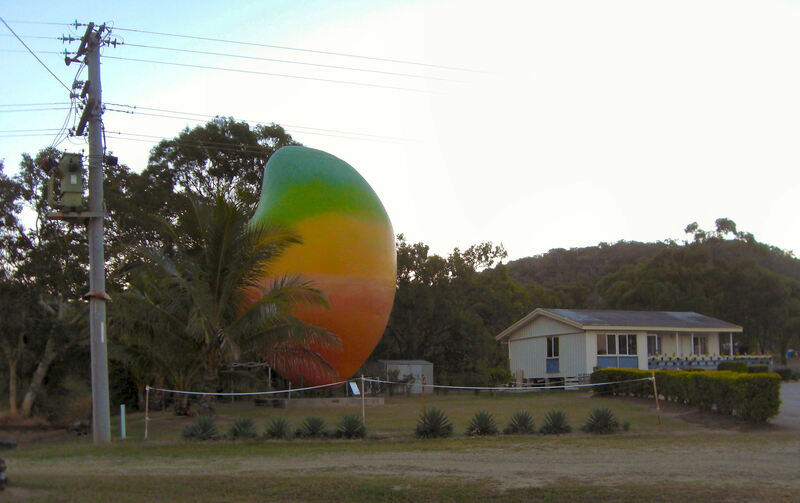 We went through Bowen, at a million miles an hour, without stopping. 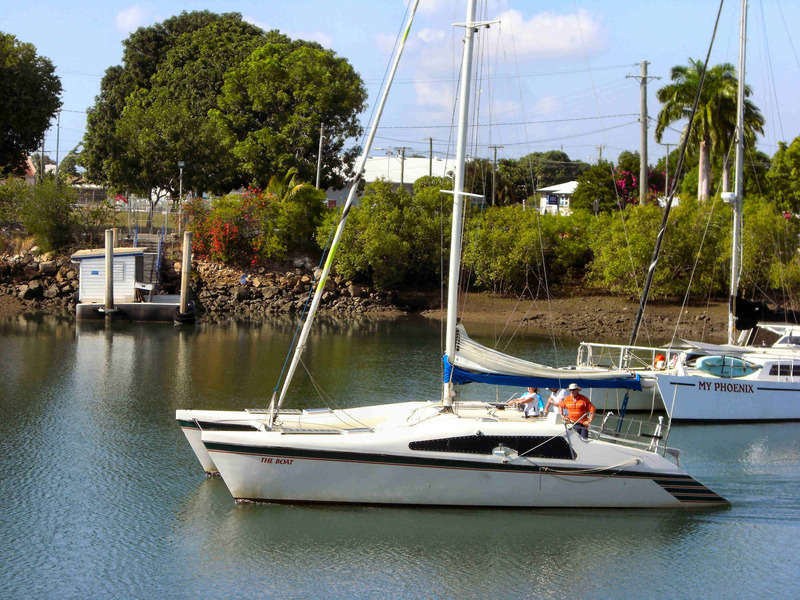 We arrived in Townsville too late to do anything but have a shower, a cold drink or two, then hit the sack. 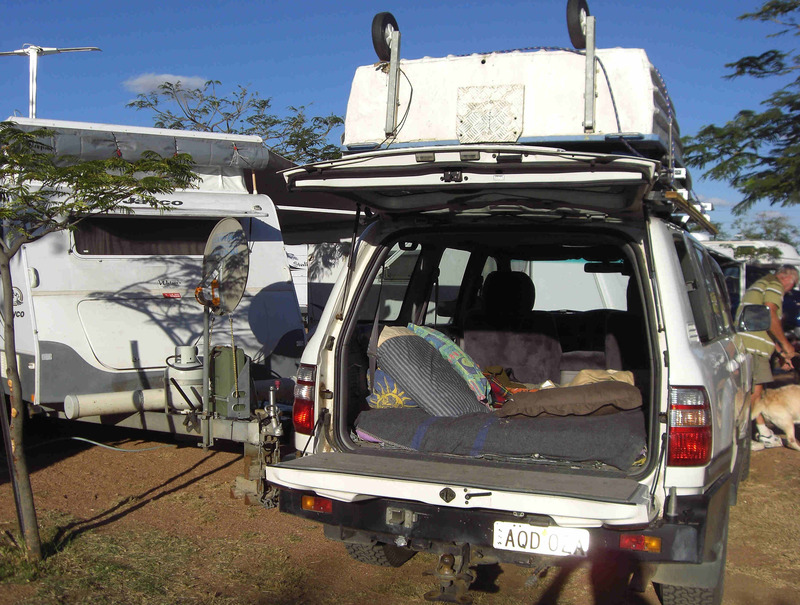 Next day we contacted the Gas Conversion man who was booked out that day but agreed to see the car on Monday morning - so we had no option but to spend the weekend in Townsville. Nerk managed to 'con his way onto a boat for the day. The boat's owner was looking for a crew and Nerk was only too happy to oblige. The owner was also an ex-PMG tech so apart from boats they had a lot in common. Barny and I stayed on dry land. 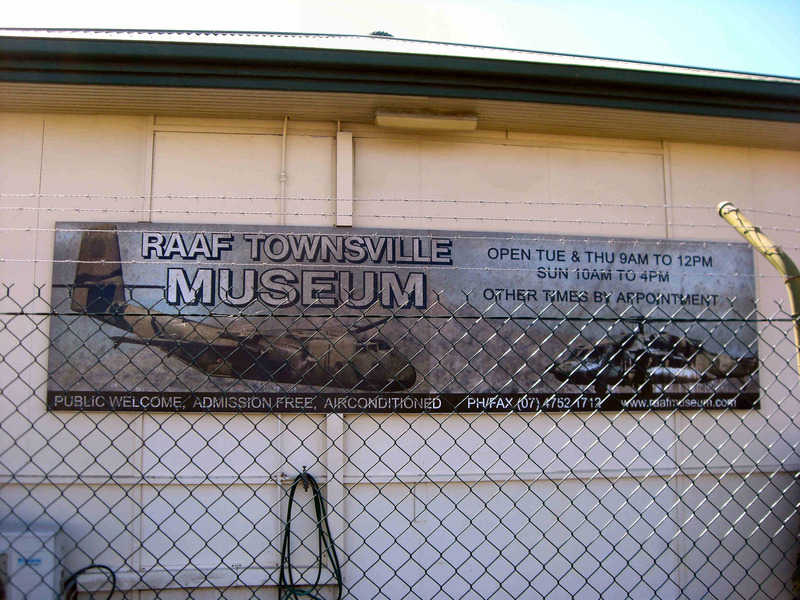 On the Sunday we went to the RAAF Townsville museum. This is run by volunteers and is not an official RAAF operation. putting the displays together and should be congratulated. Mary Hilbig, one of the volunteers, has made it her task to make the Museum the "repository" for all things WRAAF. 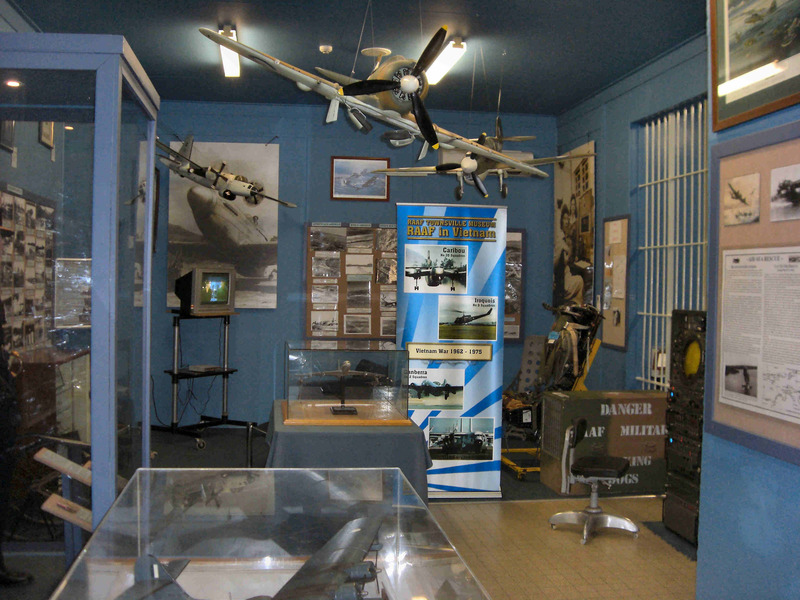 She has info and photos of every WRAAF recruit course that went through the RAAF from 1951 to 1977. 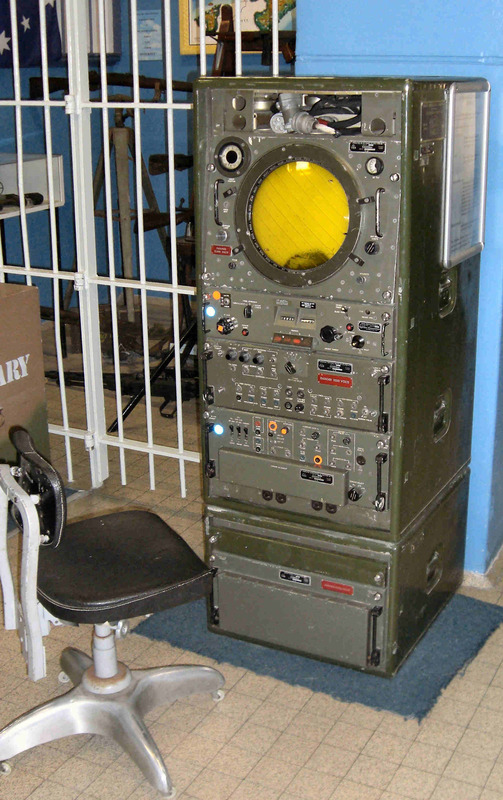 The Quadradar that was an integral part of most RAAF airports for a long time. Click your mouse on the pic for details. 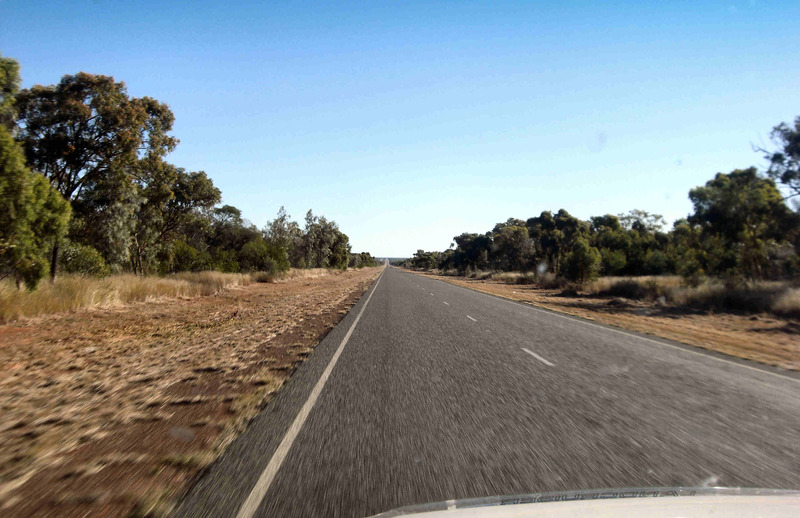 On the Monday we fronted up to the gas man, only to learn that as he hadn't been down to Brisbane to do the Gas Course, he was not qualified to work on the system - so, we broke camp and headed west down the long straight road to Hughenden, a distance of 378 klms. 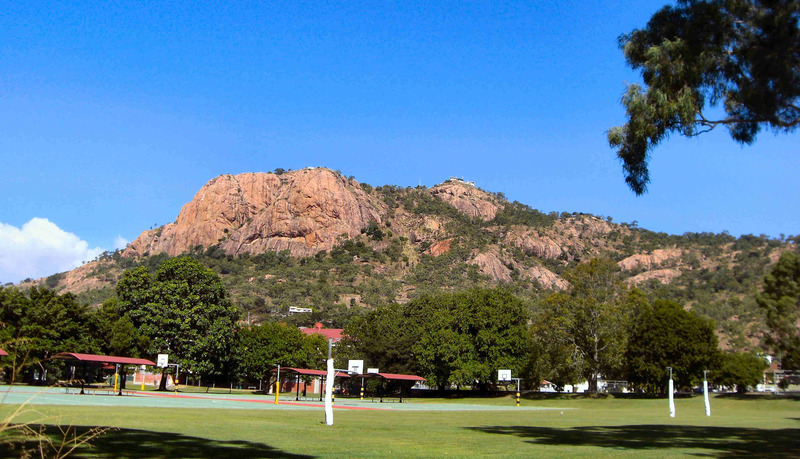 135 Klms out of Townsville, you go through Charters Towers. 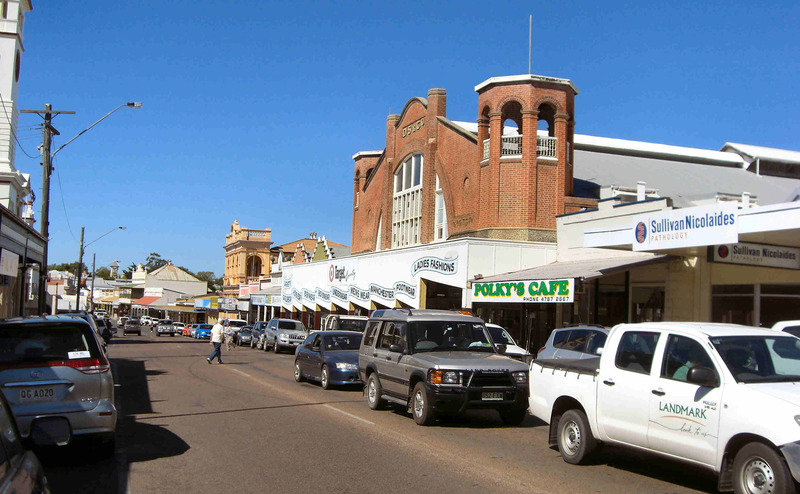 Charters Towers, the town they once called ‘The World’ was the site of a huge gold mine back in the 1870's. 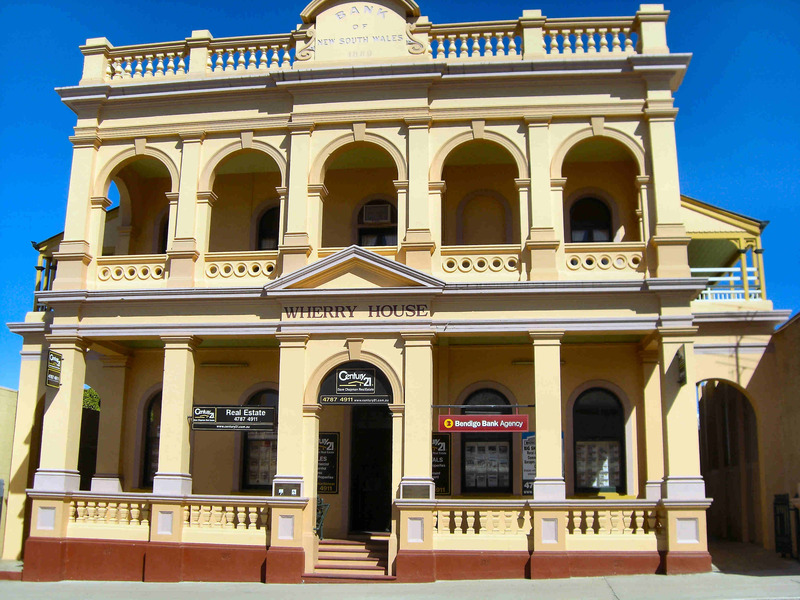 Gold production reached its peak in 1899 and by then, it was a thriving City of some 25,000 inhabitants. The City, by 1888, had properly formed streets, some wonderful houses and many grand public buildings lining the two main streets. 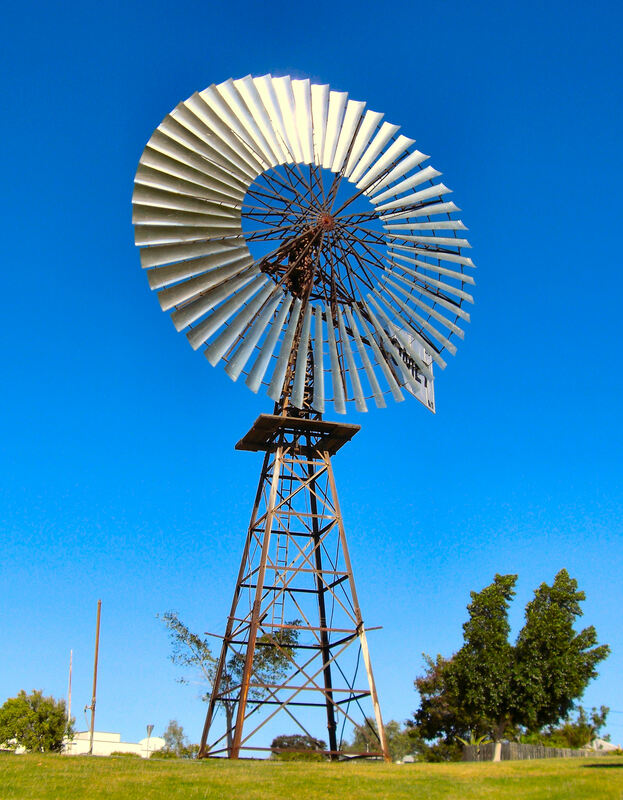 A plentiful supply of water for domestic and other purposes was pumped to the town from a Weir in the Burdekin River about 9 miles to the north. Underground electricity was also supplied to parts of the main town area. Sports, music and the arts all had fantastic followings. It was said that everything you might desire could be had in the Towers. There was no reason to travel elsewhere for anything. This is why the town became known affectionately as ‘The World’. Hundreds of shafts were sunk during the lifetime of the field and the ore raised was processed through many large Treatment Batteries. It is estimated that 6,000,000 ounces of gold was won in the first 40 to 50 years of the life of the Towers. 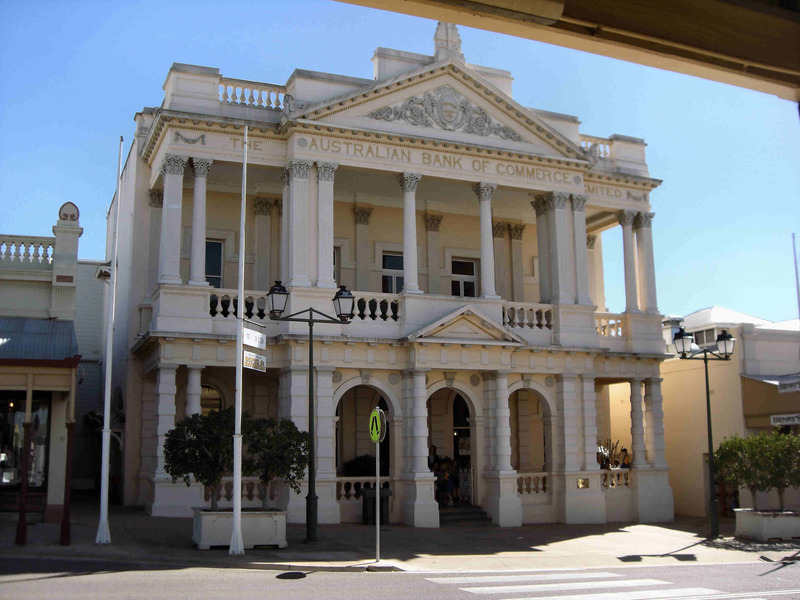 Originally designed and built as a prestigious shop and office arcade in 1888, this building became the Charters Towers Stock Exchange in 1890. 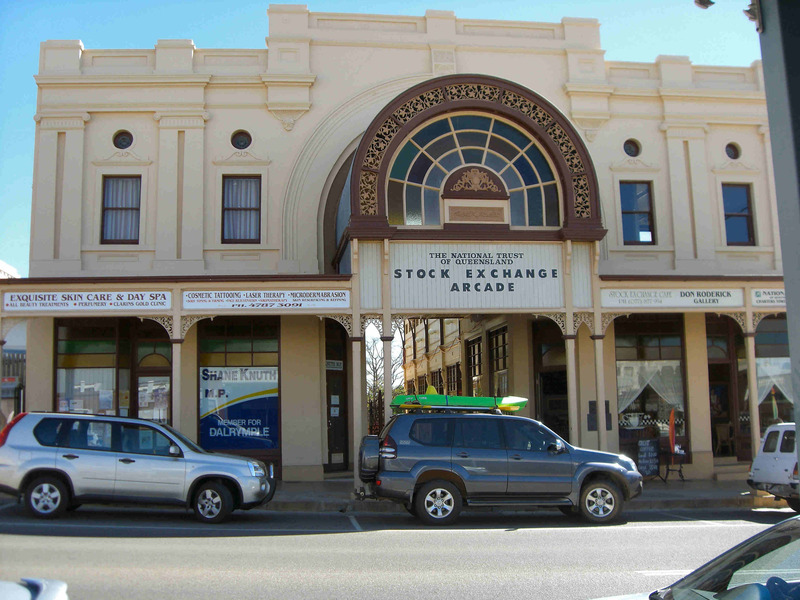 It was Australia’s only regional stock exchange and was needed to raise capital for the deep reef gold mines throughout the region. 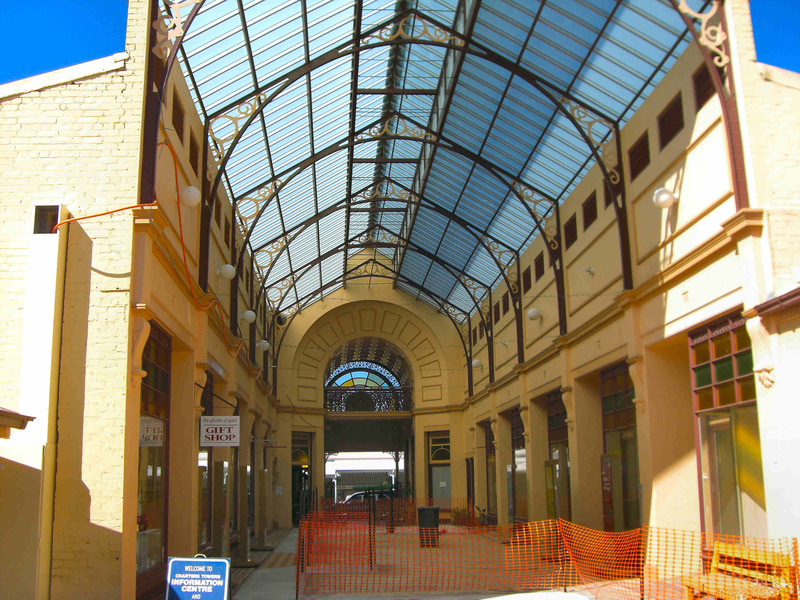 Today, the building is a great open thoroughfare which been converted into shops. The rear of the old Stock Exchange building, the walkway is undergoing refurbishment. 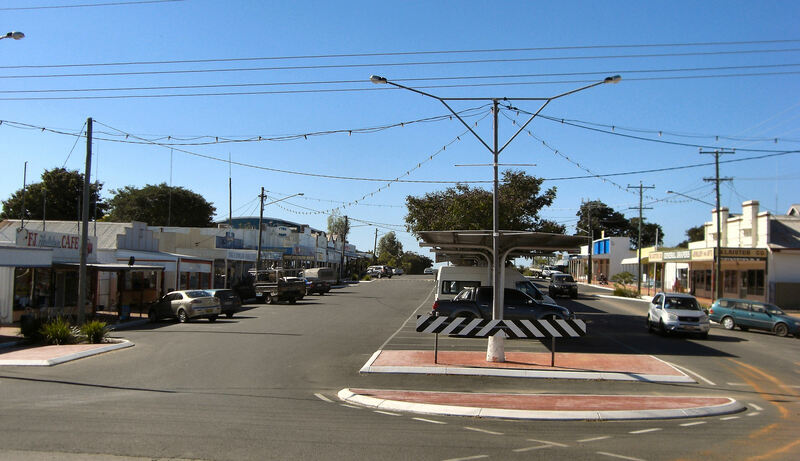 The decline of mining following World War I saw the population shrink and the town become the supply centre or hub of the Dalrymple Shire as well as the educational centre for students from all over North Queensland. 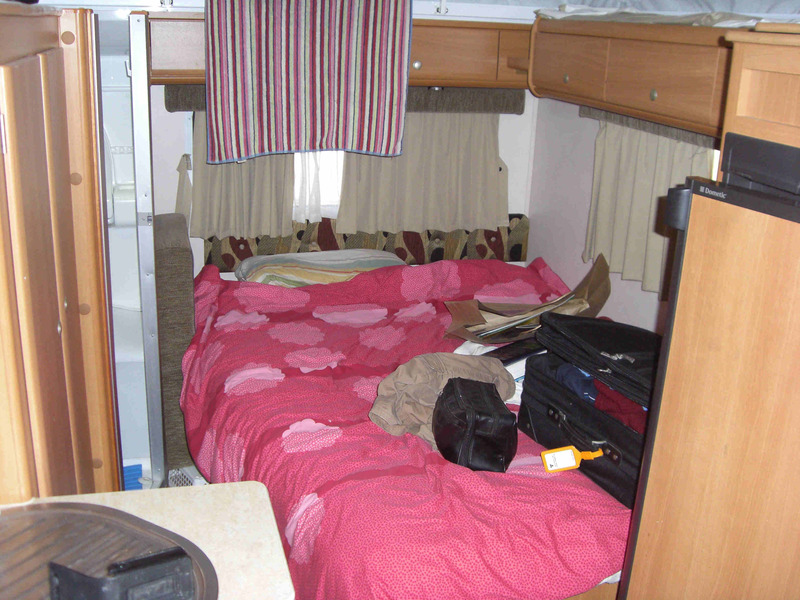 We finally arrived at Hughenden, and booked into Alan Terry's caravan park. 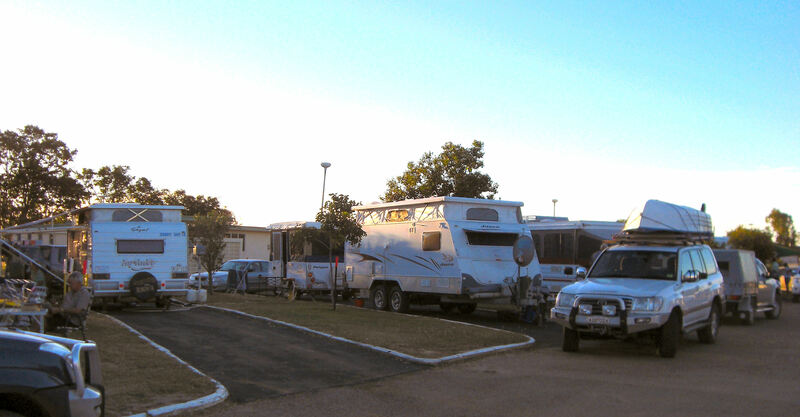 Our van site, in Hughenden. 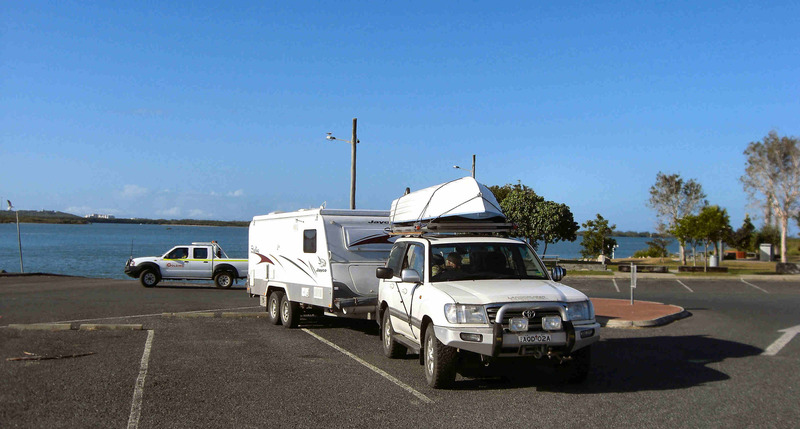 Over the two week period, we found nearly all caravan parks were either full or very close to. Nerk offered me, and of course I accepted, the bed in the van. 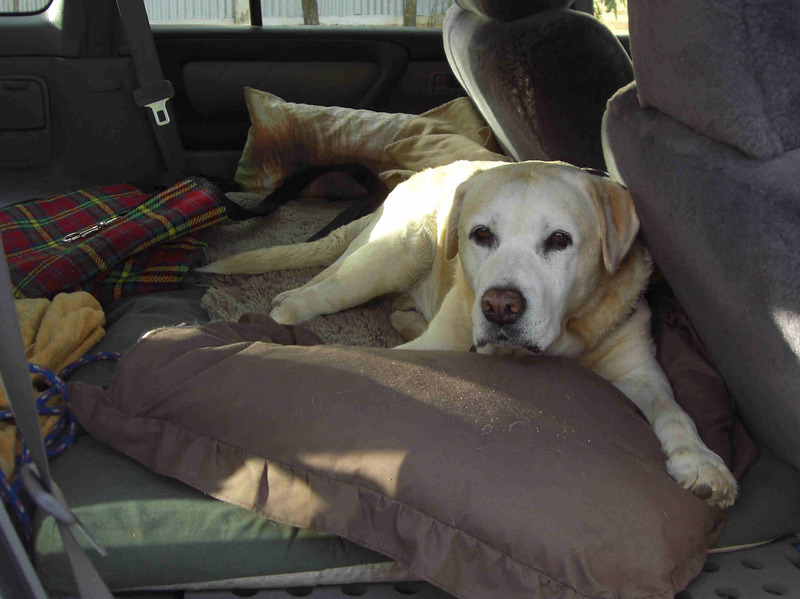 Nerk, and the dumb blond, Barny, slept in the back of the Tojo. 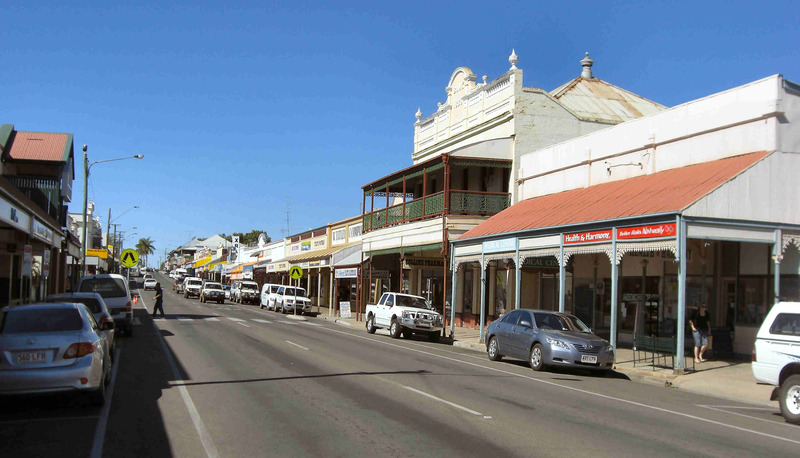 The 'main' street of Hughenden, the big attraction being the FJ Holden Cafe on the left hand side. 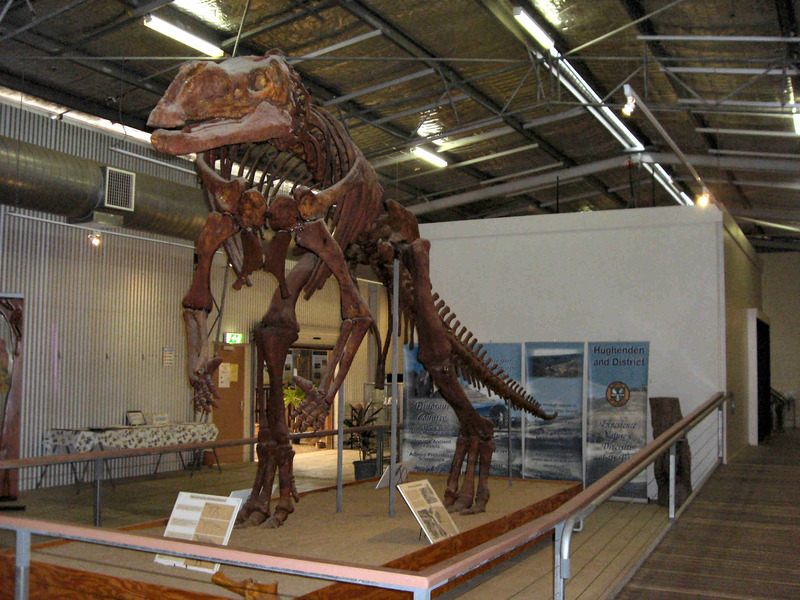 Another attraction in town is the Dinosaur display. 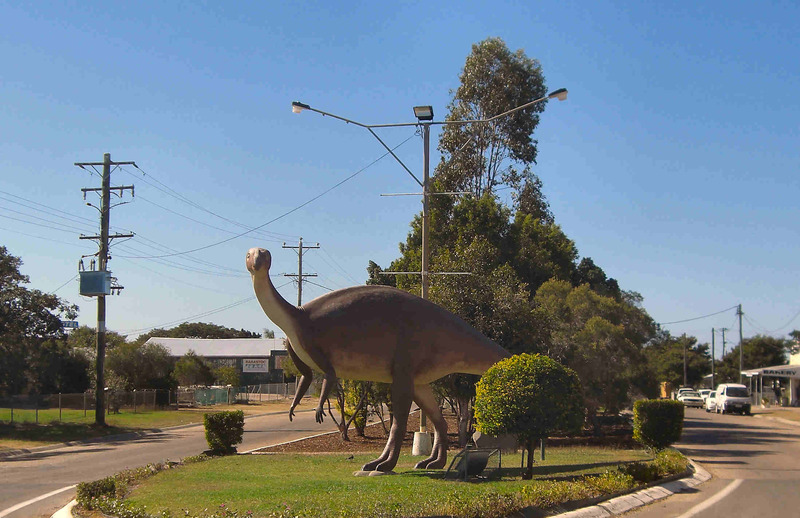 Dinosaurs even roam the main street. 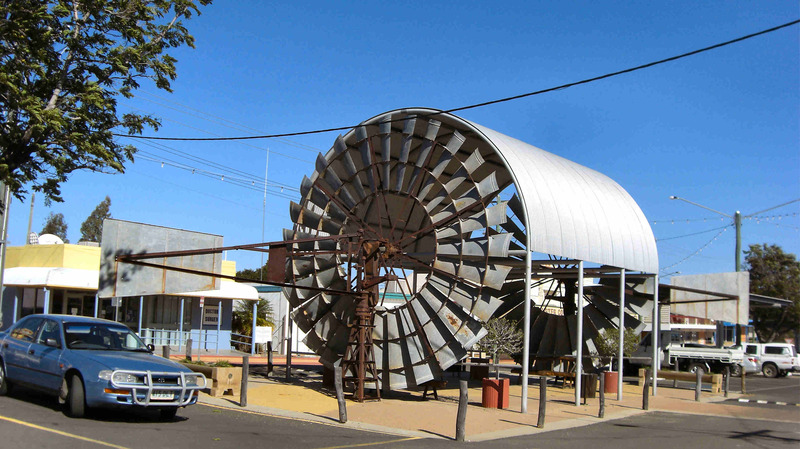 The sun shade monument in the main street. on the banks of the mighty (at times) Flinders River. The (for now) not so mighty Flinders River. 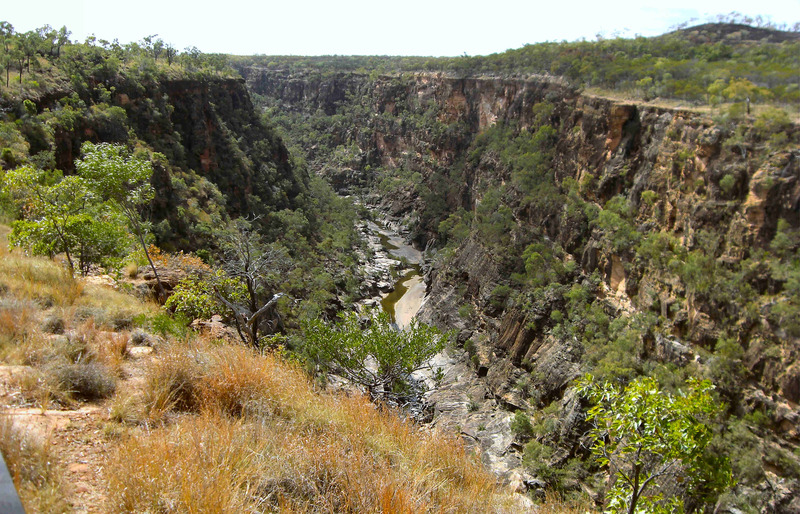 While in Hughenden, we decided we'd have a look at the Porcupine Gorge. 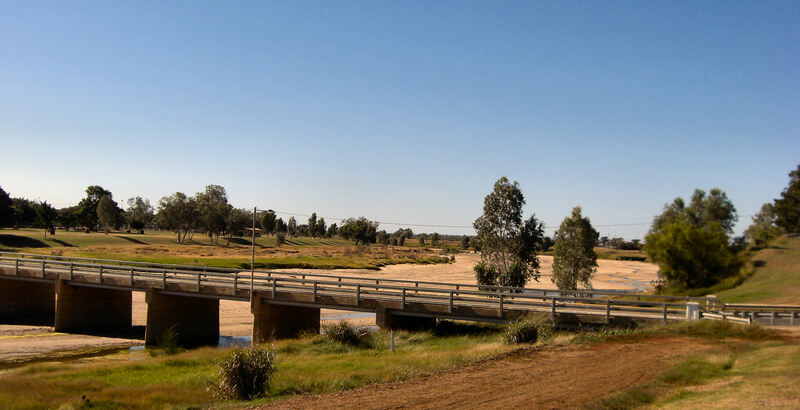 We crossed the Flinders River bridge and drove about 65 klms north of Hughenden. 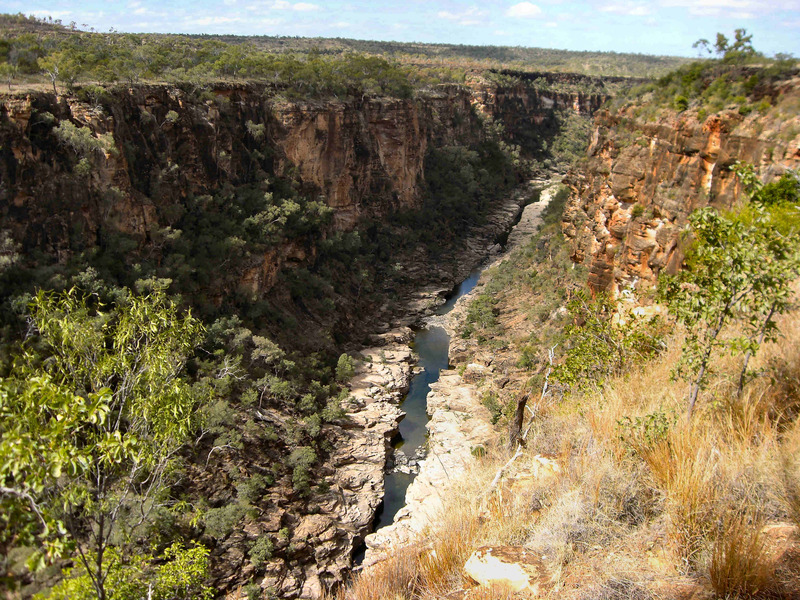 Run your mouse curser over the pic for details on the gorge. 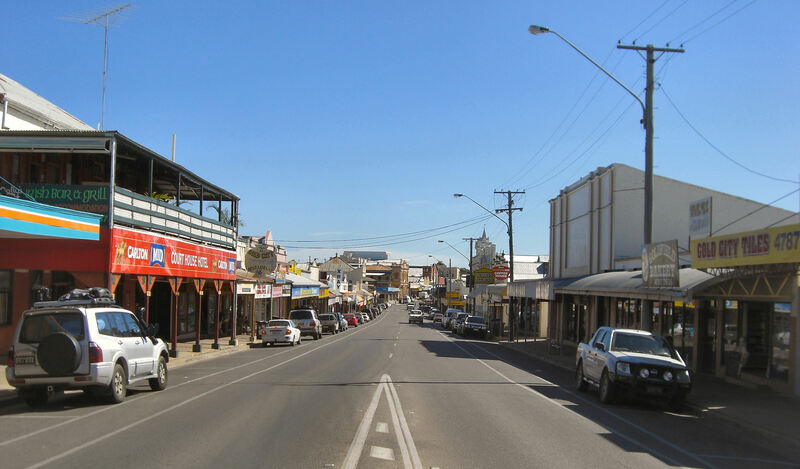 So, now it was time to head 212 Klms south down the Kennedy Development Road to Winton.